In landscaping, focal points are plants or objects that stand out from the background. Place focal points within the landscape in a way that will draw attention to a particular area of the garden. The purpose of focal points in a landscape are many. Focal points do several things in a landscape. First, they create create a resting spot in your garden. Focal points are a great way to guide a person to a destination. They are an important tool for garden designers. Why? Because they are a way to control how people will view the garden. 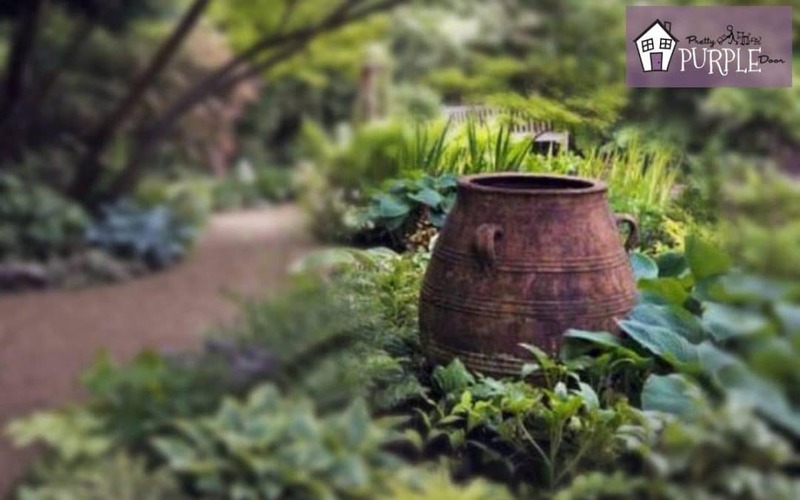 When used correctly, focal points will create a special moment (or moments) in your garden. It’s important to note that focal points do not exist in a vacuum. Focal points are always viewed WITH the other plants and elements in your landscape. So, while they are the element that stands out and guides the eye, they also have to fit with the overall aesthetic of the landscape they are placed into. Quick Tip: If you’re new to landscaping, check out my tips for beginner gardeners before tackling focal points! What does a focal point do? Focal points are a great way to clarify a space and add a unique element of surprise or wonder to your landscape. Placing focal points in your landscape give the viewer’s eyes a place to focus and rest upon. If your focal point is interesting, it will also help to guide the viewer further into your landscape. Typically, focal points stand out from the other elements around it – either in color, shape, texture, form, etc. 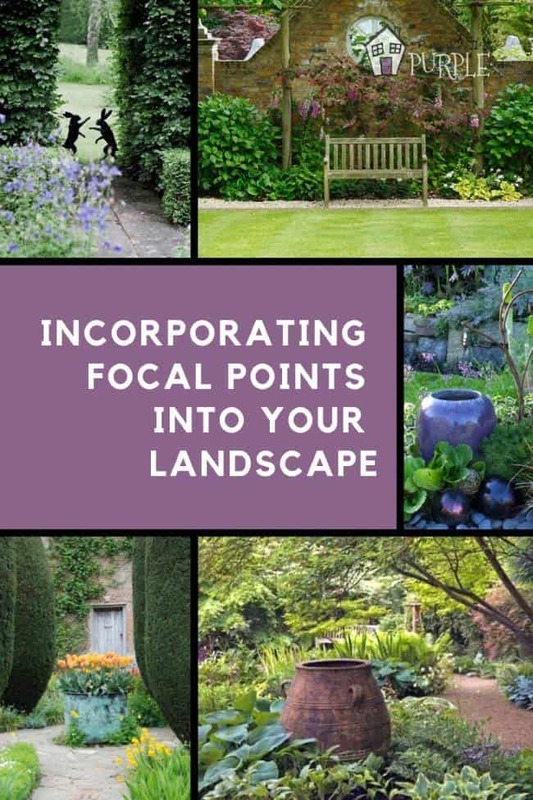 These focal points, although they “stand out” actually create restful moments within a landscape and help to guide a person’s eye from one area to another. Even if your garden is absolutely beautiful, without a focal point it’s really difficult for ANYTHING to stand out and grab attention. Everything just blends together and looks the same. Quick Tip: This post is just an overview of what focal points are. If you want to learn even more about focal points, you can purchase my Focal Points eBook. Where should I place focal points? Test first. Place all the focus objects in their assigned locations and then walk away for an hour before deciding. Less is more. Avoid the temptation to overuse and crowd an area with objects. Use focal points to dress up or emphasize architectural detail unique to your home. Focal points should be a reflection of your unique personality so have fun and be creative! What objects can I use to create a focal point? Now that you know what a focal point is and also where to place them, you may be wondering what object you can actually use for your focal point. The good news is that your focus “object” can be just about anything! You can use a stand-out plant or plant grouping. You can also place a planter or a container as your focal point. Some other ideas are a statue, a trellis, a piece of artwork, a fountain, a pond or even a bench or seating area. The possibilities are endless. Can you have multiple focal points in the same garden? Yes you can absolutely have multiple focal points in your garden. You don’t always need a large focal point. Little garden moments are just as fun and memorable. If you’re a beginner gardener, I do recommend that you start with one major focal point. In the backyard, place a focal point near the end of the garden– at the destination where you want your visitors to travel to. In the front yard, place a focal point right at the entrance to your home (the front door). After you’ve successfully positioned your main focal point you can begin to place little mini focal points that guide a person to the “main” focal point. Quick Tip: To learn more about how to design your dream landscape, check out my post on Landscape Layering. Focal points draw the eye to a particular area of your landscape. It will create focus in a mushed-together garden. You can place focal points at entryways, at the end of paths, or anywhere that there’s a change of direction or an intersection. You can also place in them in the center of an open space. Remember that you can have smaller vignettes or focal points in your garden – these little garden moments can add personality and whimsy to your garden. Remember to test out the location of your focal points first and also resist the temptation to add too much. Less is more! If you want to learn even more about focal points, you can purchase my Focal Points eBook.